Riot police fire a tear gas canister at anti-government protesters Sunday, March 13, 2011, in Manama, Bahrain. 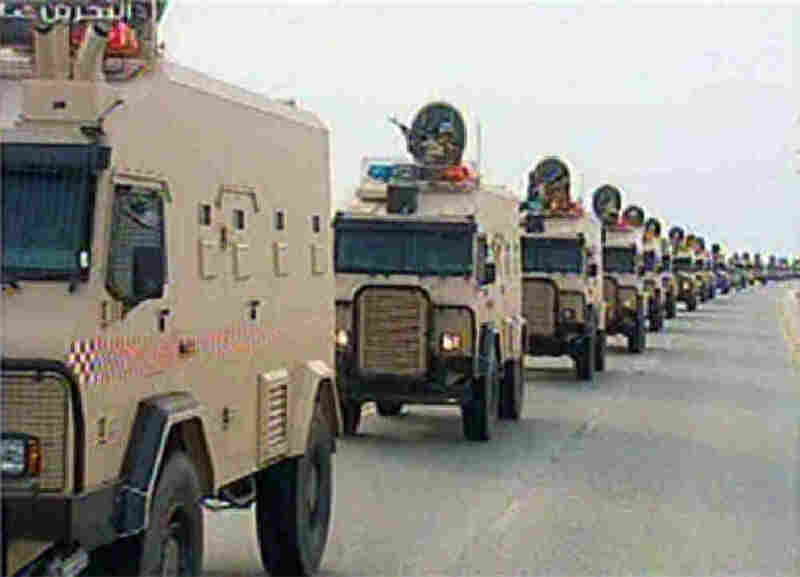 NPR's Frank Langfitt tells NPR Newscasts events have taken an 'ominous' turn with the arrival of foreign troops in Bahrain. 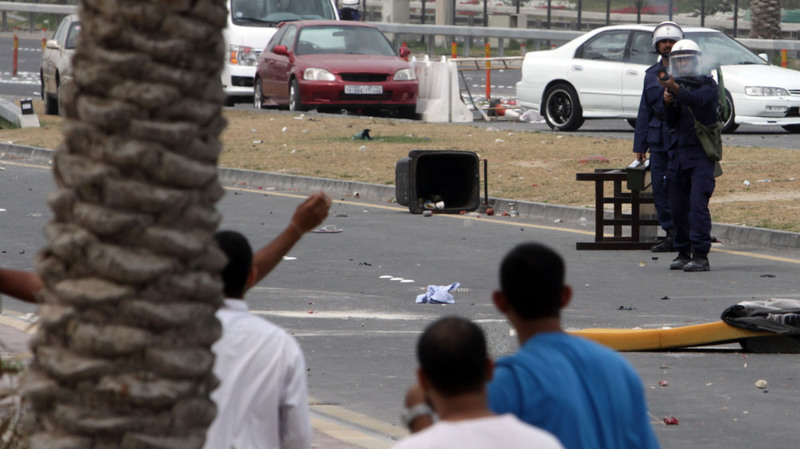 On Sunday, Bahraini protesters fought police in Manama, the capital. Opposition leaders tell Reuters any intervention by Gulf Arab forces is a 'declaration of war and occupation'. Several media reports say the troops are from the Gulf Cooperation Council, made up of Bahrain, Kuwait, Oman, Saudi Arabia, Qatar and the United Arab Emirates. Bahrain News Agency reports lawmakers in Bahrain urged the king to impose martial law after serious fighting on Sunday. USA Today says about 800 people have already been hurt by fighting in recent days. The division is also religious: the Bahraini royal family is Sunni Muslim, and they've now called on neighbor Sunni nations for help. Most of Bahrain, including the leading opposition groups, are is Shi'ite. Bloomberg says Shi'ites are demanding free elections and an end to discrimination in jobs and hiring. Update at 1:33 p.m. ET: Below is a screen grab of Bahrain's state television. It shows Gulf troops arriving in Bahrain via the causeway that connects the island to Saudi Arabia. An image grab taken from Bahrain TV shows "vanguard" of a contingent of Gulf troops arriving in the unrest-wracked Kingdom of Bahrain. The New York Times reports that "150 armored troop carriers and about 50 other lightly armed vehicles crossed bridge." The Times also reports the U.S. State Department sent Jeffrey D. Feltman, an assistant secretary of state, to Bahrain. An unnamed U.S. official told the paper it was "definitely concerned" about the troop deployments. Update at 3:58 p.m. ET: The Financial Times provides some video of Bahrain. They report that the central business district was essentially filled with tear gas. The government, the Financial Times reports, that police ran out of tear gas.